Need to know what's hot in tall for Spring? Good news. You are exactly where you need to be. Click the pic below or click Spring Up located on the tool bar to the right for all of the 2010 tall spring trends! The little white dress is a must have for spring. The tall White Shift Dress from Banana Republic is our personal fav! Click the pic for more info on this dress and all the 2010 tall spring trends. The denim skirt is something that you will see a lot of this spring and summer, especially if it's in your closet! The Raw-Edged Denim Mini Skirt from Gap is the best way to wear the denim trend. It's sweet style has a raw-edged hem that gives it just the right balance. You can wear it with anything and because its tall the length is just right to be mini without showing your mini. Get yours. Click the pic. RAW-EDGED DENIM MINI SKIRT at gap.com. $19.99. Sizes 4 to 16. Get ready for a HOT purchase. These LAVA shoes from Nine West are sure to cause some eruptions. 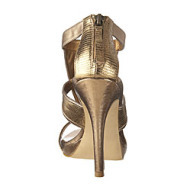 These gold, gladiator platforms will set off your spring and summer wardrobe. Click below for your very own pair. LAVA at Ninewest.com. $79. Sizes 5 to 12. Shown in gold metallic. Also comes in grey metallic. Zipper back. You are depriving your wardrobe of a key element if you do not swoop up a pair of these spring skinnies! These low-rise, super stretch skinny leggings are not only stylish but they pull on so they are SUPER comfortable too! Truck Jeans really pulled out all the stops on this spring essential. Click on the pic for your pair today! TRUCK JEANS STRETCH LEGGING JEAN at Alloy.com. $36.90 to $41.90 depending on the size. Sizes S to XXXL. Inseams 30" to 37". FYI, Jessica Simpson has a line of shoes and they go up to a size 12! They are very stylish and thankfully, especially in times like these, very affordable. Check out these super cute Jessica pumps for only $68.95. JESSICA PUMP at Nordstrom.com. HURRY only sizes 5 to 11 left. 4" heel.